Once in a role within the Building Materials Industry you would normally receive training from your employer when you start and throughout your career. These work-based courses offer you the chance to develop your skills and progress in your career. 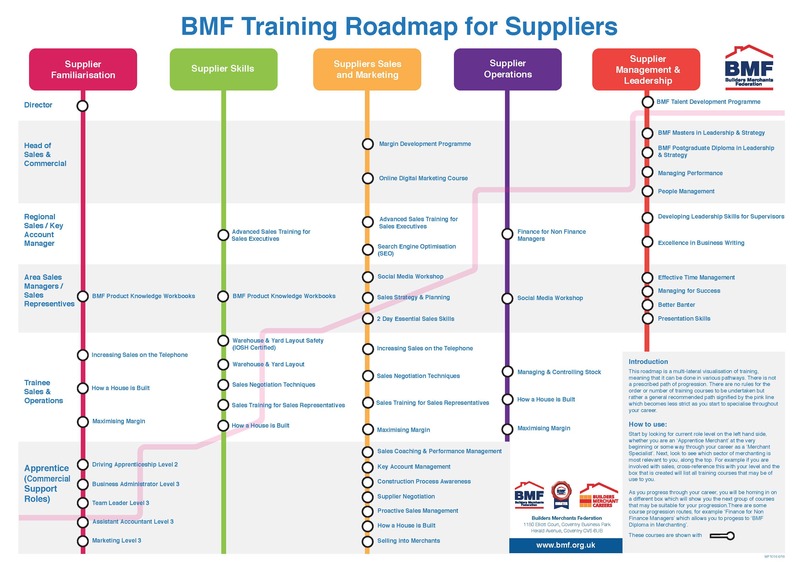 BMF training courses are designed for those in the Building Materials Industry. They are taught by tutors expert in their subjects and can lead to nationally recognised qualifications. They have split the training course into two sectors - Merchants and Suppliers. There are various areas where you can take courses, these include: Leadership, Sales, Induction and Operation, Transport, Apprenticeships and Product Knowledge. Use the tabs below to look at the courses available in these areas. This course is designed to introduce an individual into the world of supervision. It shows how to effectively gain results through the development and leadership of others, and how to make a positive transition into a significantly more responsible role within the business. Better Banter - Humour or Harrassment? This half-day course explores what constitutes banter and what is acceptable in the modern workplace. Delivered by an employment lawyer with an understanding of the Builders Merchant Sector, this course examines what is acceptable and what oversteps the mark into harassment or bullying behaviour. (Run over 2 blocks of 2 days) This in depth sales course will enhance the expertise used by existing sales representatives and provide new concepts and techniques to make the most of their sales visits. This will explore the requirements needed to ensure successful sales pitches and show how to engage your customer in your product lines and services. This engaging and interactive workshop explores the fundamental sales skills for internal sales staff that are essential in the modern marketplace. This is a Distance Learning Programme that includes a Course book and a Task book in which learners record their answers to the set questions. The benefit of this type of learning is that it can be done at a pace and at times to suit the learner. It will explain and help understand what exactly customer care is especially as seen through the eyes of customers themselves. It will also demonstrate the importance of good, clear and honest communication between customers and those people representing the business. Finally it establishes the key skills of delivering effective customer care for the benefit of the customers and the business itself. The course is deliberately designed to be interactive and engaging with lots of opportunity for participation through games and practical exercises designed to leave merchant staff with the right skills to hit the ground running! This course is designed to give a basic but informative overview of the finance side of a business, specifically for those not directly involved in the day-to-day function of financial management. This course is a must for anyone with the need to fully understand financial reports. This specifically designed course will provide delegates with an informative overview on the requirements for operating from one vehicle to a fleet. This can address any concerns over legislation and requirements relating to business transport. The success to planning any bathroom depends on understanding and adhering to the design process – which is all about knowing how to take a good brief from your customer. Vitally important is the correct and accurate way of carrying out a survey, keeping up with current compliance and how that impacts on your plan. This is the area where profit is often lost, if the plan does not work and the units do not fit then the cost of putting it right eats away into the profit of the project. If you are an experienced manager in either a Merchant or Supplier Member of the BMF, the new Postgraduate Diploma in Merchant Leadership & Strategy will be of interest to you. The BMF is working with a University who will run the course and award their Postgraduate Diploma in Merchant Leadership and Strategy to successful graduates. You will explore the different phases of a project from design to finishing, the different packages of work at each construction phase, and the different sub-contractors who are likely to be involved.